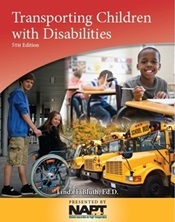 Transporting Children With Disabilities - 5th Edition, authored by Linda F. Bluth, Ed.D., contains useful definitions of transportation and related special education terms as well as characteristics of children with special needs and special considerations for transporting children with special needs. This popular publication also explains the legal basis for special needs transportation in accordance with the requirements of the Individuals with Disabilities Education Act (IDEA) 2004, Secion 504 of the Rehabilitation Act, and the Americans with Disabilities Act Amendments Act of 2008 and contains information about Family Educational Rights and Privacy Act (FERPA) regulations. If you are a current NAPT Member, please login to receive the $19.99 member pricing. To purchase a copy, please click the "Add To My Shopping Cart" button above. You may increase the quantity you wish to purchase on the next page. Please note, the Transporting Children with Disabilities - 5th Edition book will shipped via USPS Media Mail. If you plan on purchasing 3 or more books, please contact NAPT headquarters at 800.989.6278 to process your order at the USPS Priority Mail shipping rate. Orders will only be shipped once payment has been received.